46' Viking motor vessel | Christian & Co. 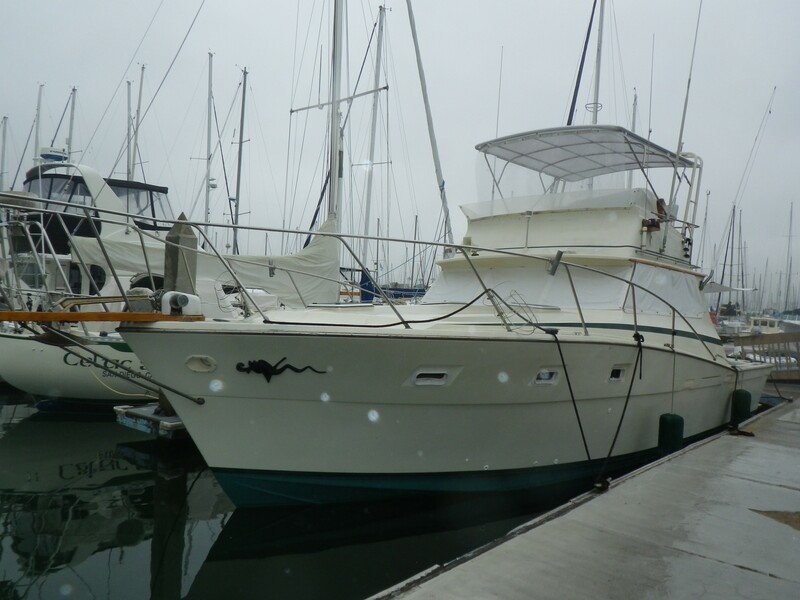 The following is an example of a Condition & Valuation Survey completed for the owner of a similar 40′ Viking Sportfisher. Model/type: Sportfisherman Engine/MFG: (2) Detroit Diesel 671 225 h.p. The vessel was inspected while afloat. Hull construction material is molded fiberglass. Deck is constructed of molded fiberglass and above deck structures are constructed of molded fiberglass. Coring is unknown. Bulkheads are constructed of plywood. Overall condition of the hull structure appears satisfactory. The vessel’s weight is 28,000 lb. Exterior rails and hardware appear satisfactory – marginal. Cosmetic condition of vessel appears satisfactory – marginal externally. Vessel’s external colors are white with green boot stripe and a green stripe about the superstructure. Below waterline through hull fittings appear satisfactory – good. The vessel is equipped with two electric / automatic bilge pumps that appear satisfactory and the bilge is holding water and minimal oil. The ventilation system consists of two engine room blowers and appears marginal. General housekeeping appears satisfactory. Engines’ external surfaces appear satisfactory – good and exhibit moderate oil leaks. Engine hour meters exhibit 992 & 1099 hours. Motor mounts appear satisfactory. Cooling systems appear satisfactory. Fuel systems and components appear satisfactory. Exhaust systems and components appear satisfactory, port riser has been replaced. Electrical systems and components appear satisfactory. Engine control systems appear satisfactory, and shaft logs are difficult to access. Steering control systems appear satisfactory and rudder ports appear satisfactory. Propulsion components were not examined. Waste systems and components appear satisfactory. General service seawater systems appear satisfactory. There is an unknown capacity in four tanks located forward and aft of saloon and outboard. Fuel tank surfaces, where visible, appear satisfactory and the securing mechanism appears good. The center aft tank reportedly leaks and is abandoned. The fuel fill, vent, feed and return lines and components appear satisfactory. The AC shore cord, inlet and connections appear satisfactory. The AC wiring and outlets appear satisfactory. The AC main feeds are protected with circuit breakers. Battery arrangement appears satisfactory. Batteries are equipped with disconnect switches. DC wiring appears satisfactory. Circuit protection for the AC and DC branch system appears satisfactory. Wire terminations and connections appear satisfactory. Wire organization and arrangement appears satisfactory. Vessel has two portable fire extinguishers manufactured in 2014 and one older unit. Vessel has no fixed fire suppression system. The safety components include: numerous PFDs and no throwable PFDs; distress flares with expired certification; CQR (no visible size) anchor with chain and line rode that appears satisfactory. Navigational and anchor lights appear satisfactory. Other safety equipment includes an electric horn. The vessel was inspected at its normal slip location. Line condition and arrangement appears satisfactory. Boarding hazards appear significant as there are no boarding steps. All entry points are reportedly kept locked. Other security consists of marina personnel. The vessel is a fiberglass sportfisherman equipped with two diesel engines. The vessel was built in New Gretna, New Jersey. The client purchased the vessel in July 2014. He stated that the vessel was in poor condition, many of the components and systems were either inoperative or not properly functional. The client has had significant work performed on the vessel, including a rebuild of the top end of the port engine, many through hull valves, sea strainers, many hoses, electrical upgrades including many panels, new countertops, new upholstery (headliner, sideliner and cushions) and a new sole covering has been purchased and is pending installation. The client stated that the generator was removed and the he installed an inverter, new charger and a battery bank for the inverter. The refit has included new cabinets. 1. Provide federally required, approved and current distress signal flares. 2. Provide a secondary anchor and rode for use in two anchor situations or emergencies. 3. Provide a suitable re-boarding device which can be deployed by the accidental swimmer. 4. Properly secure the bow rail as it is loose at several of the aft stanchion bases. 5. Properly secure all portable furniture and unsecured components before using the vessel. 6. Provide a suitable method to secure the lazarette hatch in the open position. 7. The flybridge deck forward is extremely flexible underfoot, address appropriately. 8. A temporary plastic water tank is in use, upgrade the installation or reuse the designed water tank. Comply with A.B.Y.C. (or similar) recommendations. 9. The client stated that he is only using the center forward fuel tank and the aft fuel tank has leaks. Eliminate liabilities associated with fuel tanks including removing or replacing the leaking tank and plugging or removing fuel fittings which are no longer in use. 10. Provide access to the through hull located to port aft which is currently blocked by the temporary water tank, test and prove the valve properly functional and eliminate any liabilities associated with this through hull. 11. There are no boarding steps. The client stated that most people sit on the gunnel from the dock and swing their legs over. Assure that the boarding and de-boarding of the vessel is safe. 12. There are two fuel fill fittings labeled fuel and two are labeled diesel. We strongly encourage labeling all of fuel fill fittings diesel. 13. Service and prove the all around / anchor light properly functional. 14. Remove the butterfly nuts on battery terminals. Secure battery cables using steel nuts and lock washers. Comply with A.B.Y.C. (or similar) recommendations. 15. Provide and install suitable terminal covers on all battery terminals to prevent accidental short circuiting. 16. Address the oil in the bilge, modify to prevent oil from spreading throughout the bilge and provide a system to collect and dispose of oil properly to prevent discharge of oil. 17. Access to propeller shaft seals is difficult, particularly with the temporary fuel tank in place. Monitor shaft seals for leaks and address appropriately. 1. The hull side engine room vent covers are now open to the hull with no internal covers to prevent water intrusion in rough sea conditions and no vent hoses to the engine room, modify to eliminate potential for water intrusion through these holes and assure proper air supply and ventilation for the engines. 2. Complete the installation of the interior flooring. 3. Properly secure the engines’ sea strainers. 4. Address minor water leaks seen near the starboard side of the transom internally and by the fuel fill fitting for the abandoned fuel tank and eliminate any leaks. 5. The hull sides cosmetics are marginal, improve if / as desired.